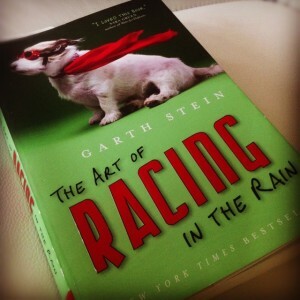 I’d never heard of Garth Stein or The Art of Racing in the Rain when I spotted a copy on a table in Vernon’s Bookland, and I don’t normally buy books without some kind of recommendation, but I was irresistibly drawn to the cover (that’s Enzo with the goggles and scarf). I bought it, loved the story and the writing, laughed out loud on numerous occasions, shed some tears, and was permanently touched by Enzo’s story, all thanks to a good cover. House of the Blue Sea originally had a different cover (and name, but that’s another story). When I was ordering the draft copies for my beta readers, I didn’t need artwork on the cover but, with a previous life in graphic design, I just couldn’t send it out in a plain white wrapper. 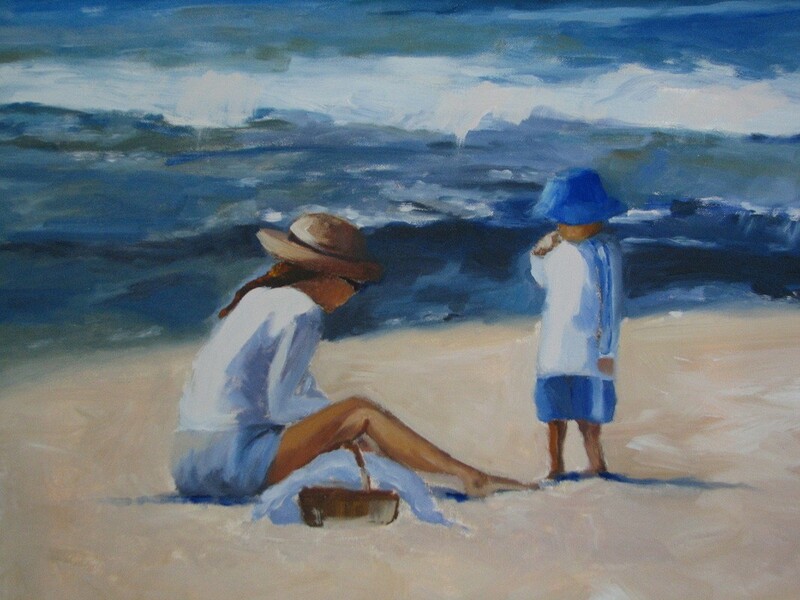 I browsed the internet for “woman walking on beach” scenes and found a terrific image on someone’s Pinterest site, a painting by an artist in Minnesota. At the time, I felt it was perfect for the cover and in the nice, loose style I’m drawn to. Problem was, when it came time to start designing the actual cover, my attempts to contact the artist went unanswered. I was disappointed. I’d become quite attached to this particular version of “Sandra” and had received positive feedback on the cover from my beta readers. But … onward. 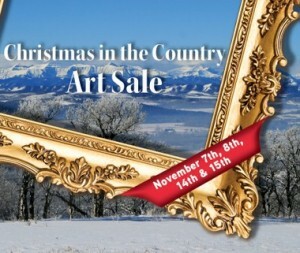 In November, my husband and I visited the Leighton Art Centre south of Calgary for their Christmas in the Country display. I love art shows, especially those that involve multiple artists, and attend them as often as I can, but, this time, I was on a mission. With my main character an artist, I felt it important to have a painting on the cover, so I was looking for an artist with a certain style to paint my beach scene. The works of dozens of artists were displayed at the Leighton show, boxes of original paintings lined the perimeter and were placed down the centre of each room of the building. I was hopeful. We entered the first room and there, by the door, on the first table, in the first box, was the work of a Calgary artist, Mary Ann Hews (Tarini). She had beach scenes of people in a style very much like I’d had in mind. I was excited. We looked through the hundreds of paintings at the show, and there were some wonderful pieces, but only Mary Ann’s work was a possible fit for the book cover. I have written a novel that I will be publishing early next year and am looking for a cover image. The main character is an artist so I would love to have a beach scene figure of her painted and I think your style would be perfect. I don’t know if you do any kind of commission work but, if this is something that might be a fit for you, I’d love to talk about it more or answer any questions. I am very intrigued about the cover of your new novel! I also have a painting called Beachwalk which might be of interest. After a few technical mishaps, the photo of Beachwalk II arrived in my inbox. 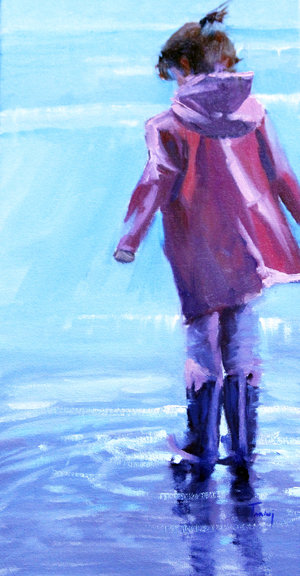 I opened up the attachment, and there she was, Sandra, walking on the beach by the Sea of Cortez (or so it seemed to me). 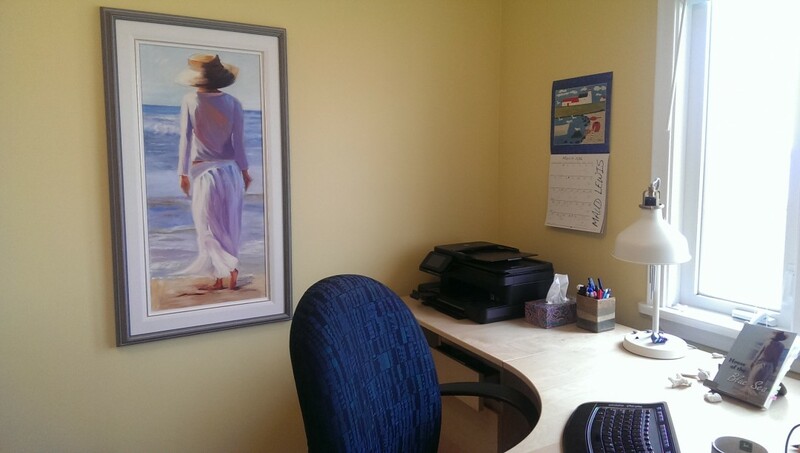 Beach Walk II now hangs behind my writing desk, a constant reminder of the serendipity of life, and House of the Blue Sea has the cover I imagined, an even better fit than the painting I’d originally chosen. And, as an added bonus, I have the pleasure of working with a talented local artist who is becoming a friend. The moral of the story? 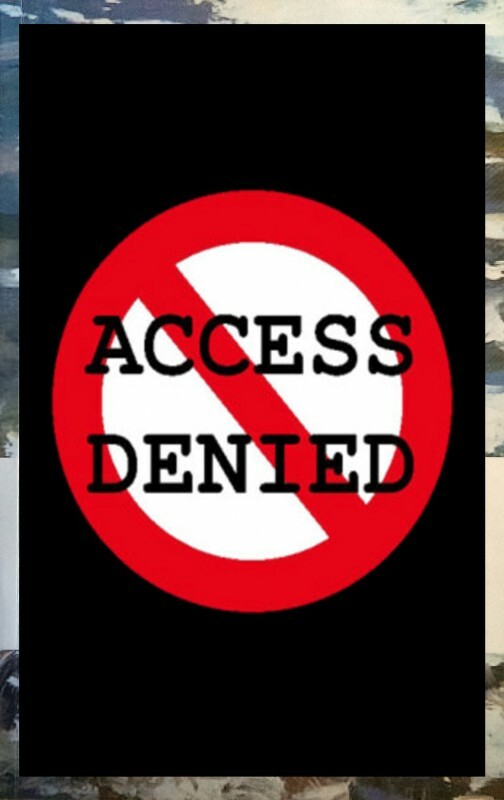 Don’t worry too much about those trails with barricades–there just might be a better path to walk. This story echoes the the themes of the book: surviving loss and finding happiness in unexpected places. I once read a quote (don’t know where) that says every loss holds a gift for you in its hands”. The loss of your first cover, and the need to find a new one, led you on a path of seeking that resulted in an exciting and rewarding outcome, with many unexpected pleasant discoveries along that path. I think this highlights the need to be open to the unkown. I hadn’t thought about the cover story echoing the theme of the novel. Thank you for pointing that out. Being open to the unknown… such a great way to travel. And I like Yogi’s advice.